Overkill Tuning - Provides the biggest bang for your buck, the improved throttle response and transmission changes make a big difference to every day performance, and new modifications are supported as you add them so it's not a one and done tuning deal, it will support every future modification. Intake system with 80mm Throttle Body - Sold together, the intake and throttle body combo provides a noticable improvement in throttle response and higher rpm passing power. Because they work so well together, and both require tuning, do them together or neither on their own. JacFab Intake Manifold Spacer - Available from JacFab directly by purchasing the 2012-15 Camaro V6 spacer. This intake manifold spacer increases manifold air volume, lengthens runner length, both of which add low-mid rpm torque, great for this big SUV. More minor mods - Exhaust work is small gains on the 3.6, you can install the mufflers you like and gain more sound than horsepower, but focus on the Y pipe section near the catalytic converters for the best gains by redoing the Y pipe with a Magnaflow Y pipe and eliminating the 3rd cat. We are pleased to be a premier tuner for the 2012+ GM 3.6 Direct Injection V6, codename "LFX", found in your 2014 and newer Impala, 2013+ Cadillac XTS and 2012+ Buick LaCrosse. We've long been GM V6 tuning specialists, tuning sedans like these that people have bought for practical purposes but want that extra performance. If you want your 300 V6 to feel like 300 horsepower and beyond, that's what Overkill tuning can do for you. Overkill LFX tuning is a performance recalibration of the engine and transmission computers. The benefits of an Overkill tune are straight forward: More power, more instantaneous, improved transmission performance, and proper support for your additional modifications. Whether you're an enthusiast or consider yourself a regular car owner, these are changes that you'll appreciate and enjoy every time you drive your Impala, XTS or LaCrosse. Specialized in the LFX motor. From revised cam phasing, fully reconstructing spark timing tables and fully revised throttle calibration, an Overkill tune is more comprehensive than what you'll get at your local dyno shop. Our tuning includes comprehensive peformance calibrations on both regular and premium gasoline, and on E85 Ethanol; our competitors commonly don't offer 87 octane or E85 performance tuning. Autocal Handheld: The best way for us to provide tuning for your 2014+ Impala is through our Autocal handheld system. The Autocal handheld allows you to take the handheld to the vehicle, read the factory file, upload our Overkill tunes and provide scan data using just the handheld unit inside the vehicle. Return to stock calibration whenever you want, apply updates and retunes easily through email with us and Overkill retuning is available at no charge for as long as you own your vehicle. You'll need a computer that can run a windows based program and has a USB port to transfer files to and from the handheld. The only intake on the market for the 2014+ Impala. This replaces your factory air filter housing, tubing and MAF sensor with new tubing and a large cone air filter. While an open cone, it greatly improves air volume into the engine and adds a great sound while accelerating. The intake shown has a black filter, but the intakes we ship now include an Amsoil air filter with prefilter that is blue in colour; you'll get it, with a silicone coupler, a top quality aluminum MAF housing and associated hardware. 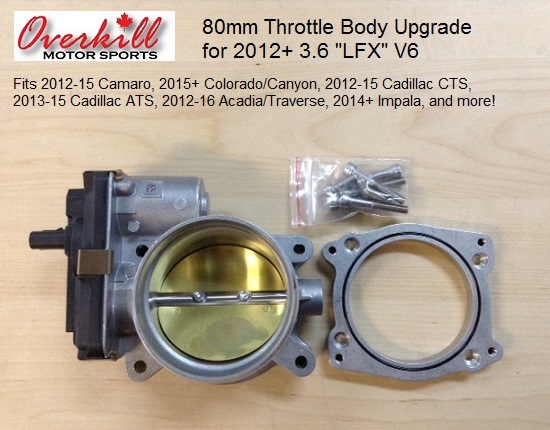 Paired with it is a our 80mm throttle body for the 2012+ 3.6, another Overkill exclusive. This throttle body replaces the small 72mm factory throttle body to improve throttle response and top end horsepower up to 9 wheel horsepower. The intake manifold inlet is already 80mm, as shown in picture, so this throttle body maximizes the flow potential of the factory intake manifold. Since the air intake pairs perfectly with the 80mm, we sell and recommend them as a paired combo, but you can also purchase the 80mm separately. Special Note: This intake REQUIRES Overkill tuning to account for the new MAF sensor size, and the 80mm throttle body also requires tuning on 2014+ Impalas for proper operation or you may get a P0068 code on the factory tuning. 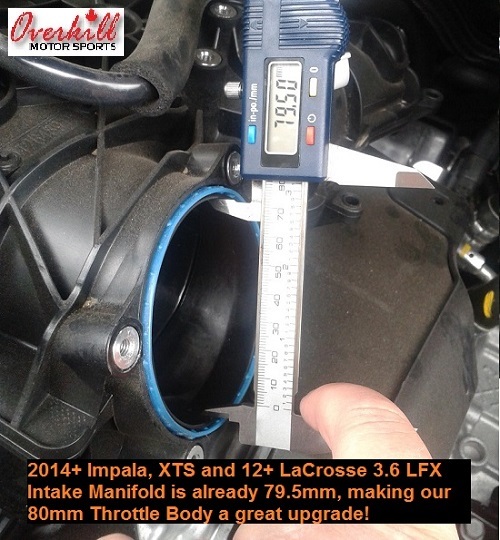 The 80mm will not fit the factory intake tubing, you'll need a bigger tube if not running our intake system. It's recommended you only purchase these items if you have Overkill tuning, are buying Overkill tuning at the same time, or have your own tuning method already in place. This will not work on the factory tuning.